When our fundraising campaign to build a school in Nepal started in September, our initial goals seemed far and difficult to reach. However, as fundraising teams began hosting events, launching creative campaigns, and bringing in donors, those goals became closer until we stomped right over them. The first goal we put to task was to raise $20,000 by December 31. Classy hit $43,097 in total funds raised before December was on our doorstep. It was all about motivation. We were motivated to start fast out of the gate, hit our goals, and go propel ourselves through their ceiling. To help you motivate fundraisers on your own campaign, we sat down with two of Classy’s most influential motivators, Rachel Lazarus and Rachele Aidala. Lazarus pushes Classy as the company-lead for the campaign, while Aidala focuses on motivating her nuclear team of 10 individuals as a team captain. Below are some of their insights on how they kept our entire company, and smaller Classy teams, pushing towards fundraising providence. You can’t motivate fundraisers in the absence of communication. It has been challenging to sustain the participation of hundreds of Classy employees, but the simplest communication tool available—email—has been one of the strongest in Lazarus and Aidala’s repertoires. It’s simply best practice to always have an ongoing dialogue with your fundraisers,” says Lazarus. Lazarus recommends you send one email per week to your fundraising cohort, at the bare minimum. No matter how busy you are there’s always time to send at least one email. I don’t do much beyond emails to keep all of Classy motivated and working towards our fundraising goal,” says Lazarus. “But that only speaks to the importance of sending emails. Aidala abides by similar email best practices to keep her fundraising team motivated. Further, she and Lazarus both place a premium on engaging content for their communications. For Aidala, engaging content is simple content because it’s easier to digest. That, in turn, keeps her fundraisers more invested, interested, and motivated in the campaign. And simplicity doesn’t correlate with ineffectiveness—you can accomplish a lot with just a few sentences. We don’t have a Slack channel, and we’ve never had a face to face, sit-down meeting,” says Aidala. 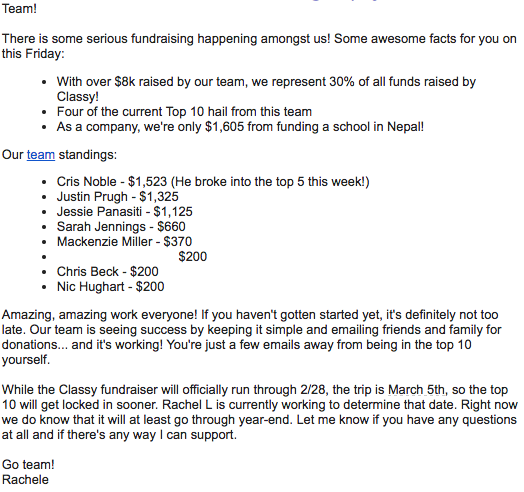 “Yet our team has raised almost $10,000 for the school in Nepal, and we’ve done it by only sending emails back and forth. Tips and tricks Aidala sends to motivate fundraisers on her individual team. Your content must also be structurally sound and have a great layout. Lazarus, after spending years working in major gifts with nonprofits, has developed a strict format for her communications. I always start communications with progress updates, then I go into recognition content,” says Lazarus. “Put the most important things at the top and the less important content at the bottom. One of the emails Lazarus sends all Classy employees on a weekly basis. At the end of the day, your goal with content is to get people to read it. Make sure everything you send your fundraisers is worth opening. If every communication is quality, your fundraisers will read, engage, and keep your goal top of mind,” says Aidala. “Putting the time and effort into quality content pays off big with fundraising motivation. A great way to motivate your fundraisers is to think outside the box and create content that excites. Perhaps one of the best ways to accomplish this is getting creative when it comes to recognizing and publicizing your fundraisers’ hard work. If it’s your job to motivate an entire team of people to fundraise, recognition is paramount to success. 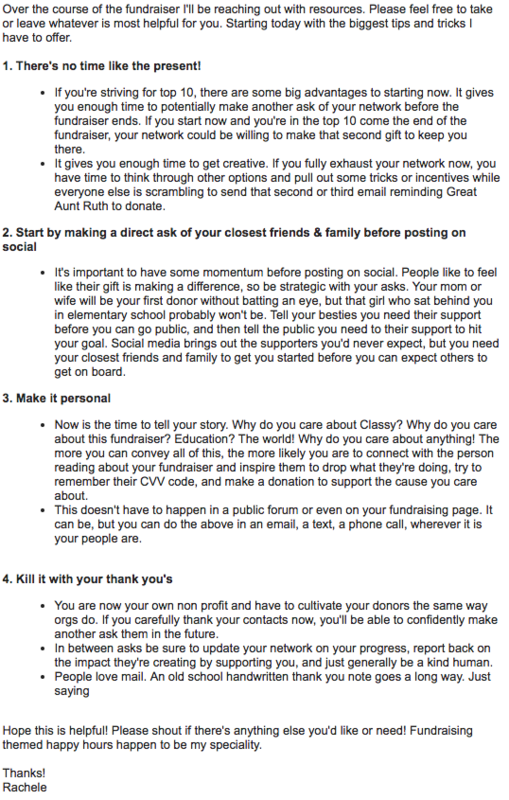 Failing to recognize your fundraisers’ efforts can cause them to feel you’ve given up on them. In turn, they may give up on your campaign. 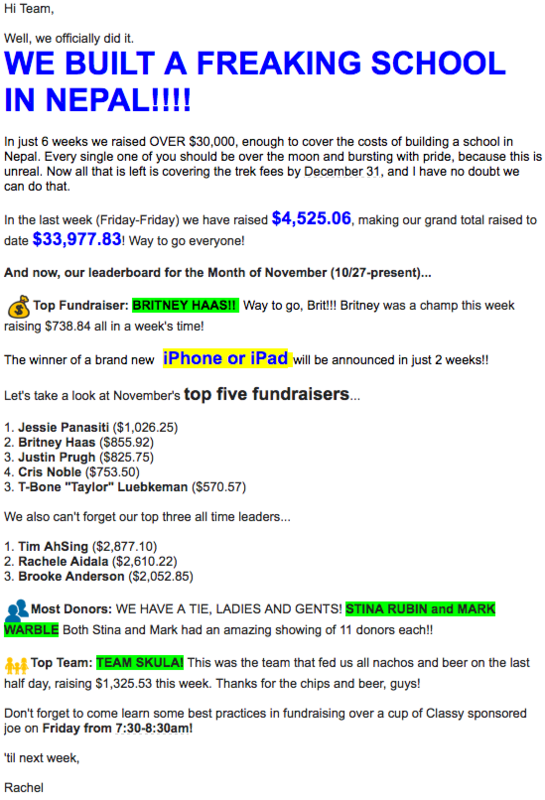 For our specific campaign, Lazarus sends out emails that call out the top weekly, monthly, and all-time fundraising leaders. I want people to know that every week they have the have the opportunity to be recognized. That’s a powerful piece of my weekly emails,” says Lazarus. A leaderboard is motivating in and of itself. But what if nobody from a fundraising team made the list? Further, what if fundraisers from that team were only a few dollars short of big time recognition? To keep her team motivated, Aidala brings Lazarus’ best practices to a micro-level for her fundraising team. She sends out her own email with their team-specific leaderboard to encourage their efforts. An example of Aidala updating her team with their own, personal dashboard. Aside from helping fundraisers feel proud of their efforts, recognition also builds in a healthy spirit of competition into your campaign. Both Aidala and Lazarus agree that competition may, in fact, be one of the strongest motivational factors in fundraising. Competition spurs your fundraisers to grab a top spot on the leaderboard. Don’t forget that it also prompts your fundraisers to band together as one to beat the clock and reach your goals. Aidala, self-proclaimed to be the most competitive person on Earth, sees competition as a key to success when it comes to motivating fundraisers. However, she takes it a step further. 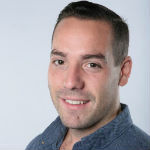 I also think a competitive attitude is an important quality organizations should focus on when looking for fundraising team captains,” says Aidala. “You have to be driven and competitive because fundraising is a grind. Use competition to motivate yourself and your team beyond just the cause itself. As a nonprofit, identify people within your organization, like Lazarus and Aidala, who have the qualities to successfully motivate your fundraisers. With the right people in motivational roles, you’ll hit your goals before you know it. Our Classy campaign’s success is a combination of many factors. The chief element is motivation and reinforcement of people’s fundraising efforts along the way. Lazarus, Aidala, every other team captain, and each employee fundraising have come together as one to hit our goals. No matter how big or small, we’ve taken the time to appreciate and thank the hard work of our fundraisers. Whether it’s a team of 10, or a fundraising cohort of 200, motivation is a necessary ingredient to successful fundraising. Classy has seen monumental success during our fundraising campaign to build a school in Nepal. Part of what’s helped us blast through our goals are the tactics from company and team captains to motivate fundraisers along the way.